Stayed Behind, by Brian McCullagh and Dr. J. Ernest Aldred. It's only 38 pages long and has some interesting photos and information within. The booklet is about two 'mechanists' from the Soo show, Phil Davies and Ernest Aldred, who stayed in Australia after Chung and the rest of the company moved on. Within the 38 pages is a page on an illusion called The Lantern Illusion. This was created by Soo in 1907 and was also known as the Glass Casket, and also known as The Slave of the Lamp. I still remember reading about this illusion back in 1998, it had left a large impression on me. The illusion seemed incredible. A large 'lantern' made of glass was brought on stage and was proven to be empty. Then a cable was connected to the top and it was lifted off the stage. It was then spun and as it spun in circles the light would catch it and it made an incredible sight to see. Then, suddenly the figure of a woman appears inside the lantern as the cage is spinning. Except, the woman faces forward and does not spin, only the lantern surrounding her spins. Sounds pretty amazing and I sure don't recall seeing anything like this in any show of modern times. 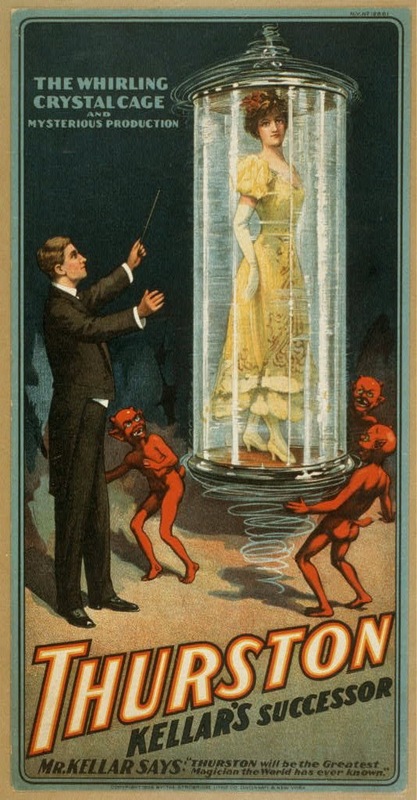 So that brings me to the illustration here of Thurston presenting 'The Whirling Crystal Cage and Mysterious Production'. I had come across this on the internet maybe a year ago and the moment I saw it I remembered the Chung Ling Soo booklet. This must be the spinning lantern trick I had read about years before. Much like a LOT of magic back then, more than one performer was presenting it, sometimes legally, sometimes not. There were two copies made in Australia by Phil Davies. Thurston had a copy, which I assume he got permission to build from Soo. Though, Harry Kellar was known to steal everything, Thurston, as far as I can tell, got permission. There is one Soo Poster that depicts the illusion. It can be seen in the Gary Frank book Chung Ling Soo the Man Behind the Legend. AND it can be seen in the Todd Karr book, The Silence of Chung Ling Soo, it's poster #36 near the front of the book and there it is called 'The Spinning Cage'. In the Silence of Chung Ling Soo, Jim Steinmeyer has a short chapter on the illusion. It appears on pages 16-20. Jim describes the method used for the illusion, which I must say is quite elaborate. And he mentions that the illusion must have weighed upwards of 750 lbs. If you add the weight of the assistant, you've got 850lbs. That wouldn't be such a big deal except this big behomoth is spinning in the air! I so want to see this thing in action!!! But, I don't think that is ever going to happen. It must have been a thing of true beauty. In fact, Percy Abbott, in his biography, A Lifetime of Magic, says this about the illusion, "This was a beautiful and spectacular effect. I can safely say one of the most beautiful I have ever witnessed and, believe me, to make that statement after viewing magic for more than sixty years, is unusual." Does anyone know if any of the 5 Spinning Cage/Lantern Illusions exist anymore? I wish I could be of help, Dean. I also read about this illusion in the Todd Karr and Steinmeyer books. Thurston's version most likely rotted away in that New Jersey landfill where his Kellar Levitation also met its demise. I know that some of Thurston's illusions were stored in an old Midwest barn that were rescued and restored by Mike Caveney and a friend. I would ask Mr. Caveney if he had any knowledge of its whereabouts. He might know.